Check out our range of fun crocodile facts for kids. Learn where they live, what makes them good hunters, how much they can weigh and much more. Read on and enjoy a variety of interesting information about crocodiles. The physical characteristics of crocodiles make them good predators. Crocodiles are fast over short distances. Crocodiles have the strongest bite of any animal in the world. The muscles that open crocodiles jaws however are not so powerful, reasonably strong people could hold a crocodiles jaw closed with their bare hands. Like other reptiles, crocodiles are cold-blooded. Crocodiles can survive for a long time without food. Most crocodiles live in fresh water rivers and lakes but some live in salt water. Crocodiles eat a variety of fish, birds and other animals. Crocodiles release heat through their mouths rather than through sweat glands. The saltwater crocodile is the largest species of crocodile. Some crocodile species can weigh over 1200 kg (2600 lb). Like alligators, crocodiles are part of the order ‘Crocodylia’. 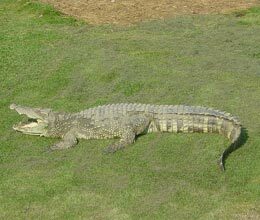 Check out some interesting crocodile and alligator differences.